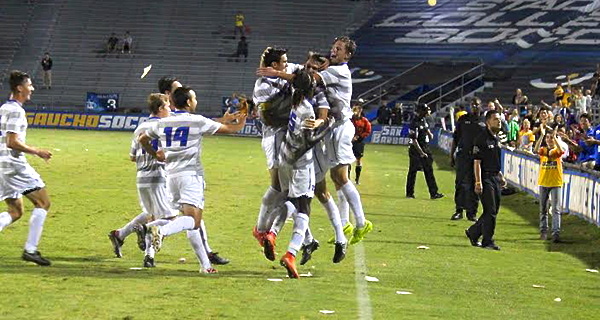 UCSB players mob Nick DePuy after his game-winning goal in the final seconds against UC Irvine. Nick DePuy is making it a habit. The sophomore sensation netted his second consecutive game-winning goal, this coming in dramatic fashion. With the game seemingly heading to overtime, DePuy unleashed a left-footed shot from 35 yards that went over the outstretched hands of UC Irvine goalkeeper Michael Breslin and into the back of the net with a mere 36 seconds left in the regulation, giving UCSB a 1-0 victory over the third-ranked and previously undefeated Anteaters in a Big West soccer match in front of 4,731 at Harder Stadium. “You cannot script a game like that,” said UCSB head coach Tim Vom Steeg. Winning late versus UC Irvine has been routine for UCSB in recent years. Two seasons ago, Nic Ryan beat the Anteaters with a game-winning goal in the second overtime. Last season, Kevin Garcia-Lopez gave the Gauchos the win with under two minutes left. DePuy knew what he needed to do as Vom Steeg reinserted him into the tense match with 15 minutes left in regulation. While it didn’t happen exactly like that, Vom Steeg has worked his personnel magic once again. Vom Steeg, in his 16th season as head coach of the Gauchos, is renowned for his ability to move players around the field, and get the most out of them. Since being pushed up to forward from the midfield, DePuy has scored three goals in four matches. But they held the Anteaters scoreless. Reed McKenna was dynamic in attack for the Gauchos, especially in the second half. With the win, UCSB (6-3-1 overall, 2-0-0 Big West) handed UC Irvine (8-1-2 overall, 0-1-1 Big West) its first loss of the season, and continued its impressive start to Big West Conference play. The Gauchos capped off an impressive six-game home stand with a record of 5-1-0. UCSB hits the road for four straight games, beginning with a match at Cal State Fullerton (4-5-2 overall, 0-2-0 Big West) on Thursday. “We got a big couple of games on the road and hopefully (we’ll) get some results,” said DePuy.